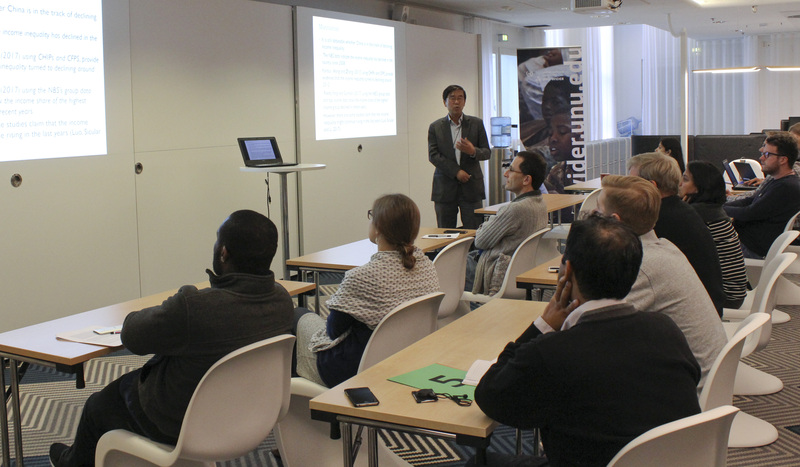 UNU-WIDER has a longstanding tradition of holding weekly academic seminars touching upon key issues related to development economics. This autumn’s sessions have caught the attention of many working locally on development topics, with government officials, representatives from civil society, and local students taking part in presentations and lively discussions. Interested in attending the WIDER Seminar Series? Join us at one of our upcoming sessions. Shi Li spoke on income inequality in China. In addition to UNU-WIDER researchers, as well as visiting scholars and students, guest speakers have been invited to present on key topics. The season started with Professor Li Shi – one of China’s leading experts on income inequality – who presented his research on trends and changes in income inequality in China. Shi has found that while income inequality increased rapidly over the period 1980 to mid-2000s, it has been declining since 2008. His work identified a narrowing gap between rural and urban incomes as one of the factors contributing to this decline, which is argued to be driven by several policy measures such as introduction of a pension scheme, tax exemptions for agricultural income, and agricultural subsidies. Pauline Rossi discussed her findings on health investments in Senegal. 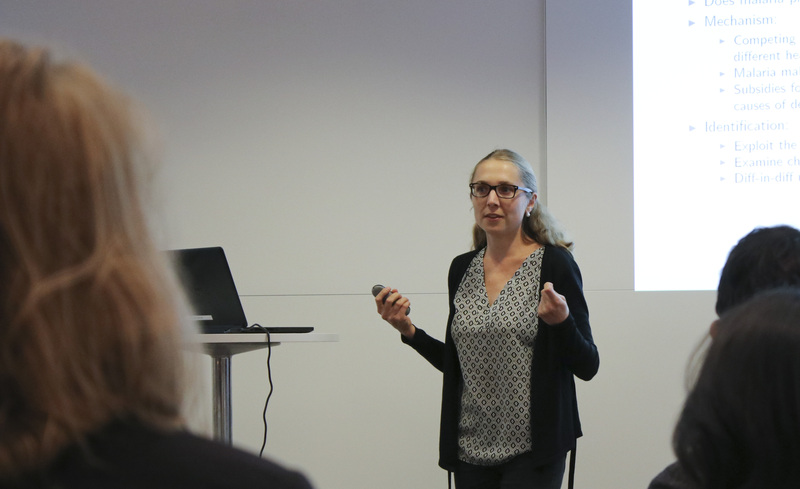 Pauline Rossi, Assistant Professor at the University of Amsterdam, presented her research this autumn on recent work on high subsidies for anti-malaria products in Senegal and its influence on health investments in private households. Within development economics it is often discussed how recipients react to health subsidies; one side argues that subsidizing is fungible by nature while its proponents claim that it will motivate households to increase overall health expenditures. Rossi’s research – grounded in Randomized Control Trials from multiple datasets – had robust results indicating that especially poorer households raised their private expenditures to fight malaria and other diseases when receiving subsidies for anti-malaria products. The WIDER Seminar Series will continue this fall, showcasing new research from invited speakers, visiting scholars, and UNU-WIDER’s in-house experts. Local policy makers and others working in development are welcome to join one or all of the seminars, including University of Kent Lecturer Anirba Mitra's presentation on cash for votes in India on 22 November. For more information and the full autumn schedule, please visit the WIDER Seminar Series page.